Love it. This is a great, no smell, easy to carry, empty, and clean compost container solution. I have not looked in to replacing the charcoal filters. If that is reasonably priced and available, this is a five star item. EDIT: Yes, we've been using this for a long time now and it IS a five star product. Not because the filters are "reasonably priced and available", but because I found you can wash the filters with dish soap, air dry. and they are good for weeks or months again! This stainless steel compost pail is perfect for collecting food scraps for your compost pile . You won't be embarrassed to have it sitting next to your sink, and you'll find yourself telling visitors about the benefits of composting when they ask what it is. a handle to easily carry it outside to the compost bin. 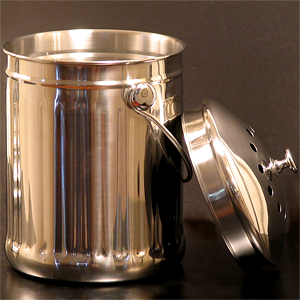 The stainless steel compost pail holds 1 gallon of kitchen scraps and other organic materials. It measures 11 inches tall, with a 7 inch diameter.